Insolvencies and impairments are at such a low rate in P&C that most agents do not pay much attention to the possibility one of their companies may fail. (This is not necessarily true in health benefits and LTC, an issue of societal importance that has been ignored because so many of the companies that have had issues were set up specifically under the ACA). I now meet people in the insurance industry who have never, ever had to deal with rolling a book because the carrier went insolvent or even pulled out of the market overnight. Not long ago, who would have thought that possible? Old School Loss Control...Same Old Results- The cliche is that you "get what you inspect, not what you expect". This is particularly pertinent to underwriting P&C insurance. Of growing value to the "expect" side of the equation is utilizing data analytics and trying to crack the code on what informational element will be predictive of loss or quality of the risk. First, my heart is with small agencies and their owners. They have a tough time wearing so many hats. Delegation only works when other people are around to wear the hats. Agencies everywhere are pressured by carriers to write more business but small agencies have limited resources when the owner is the key producer, the HR expert, the IT expert, the accounting expert, and the chief bottle washer. Most owners of small businesses, many executives/owners of medium businesses, and even quite a few executives/shareholders of large businesses think the most important aspect of a business appraisal is the final number. The business is worth $X dollars. Chris Burand shares his "must-read" annual state of the property/casualty insurance industry report with his forecast for the industry and independent agents. Burand looks at insurers' recent profitability, if it is sustainable, and what it means for agents, brokers and smaller carriers. Read Chris Burand's insights into the financial condition of the industry and what he predicts for the future in his latest edition of the State of the P&C Insurance Industry. A Great Read: "When Words Collide: Resolving Insurance Coverage and Claims Disputes"
These numbers hide an interesting and important reality. 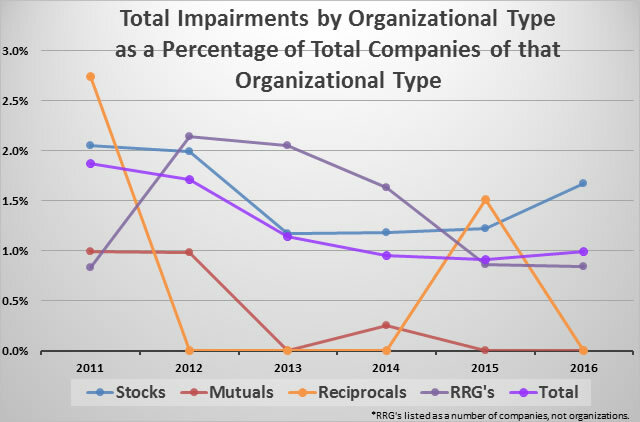 About 10%-15% of P&C companies, or on the five-year average between 2012-2016, inclusive, 176 companies, a year go away per A.M. Best (my calculations). Most of these companies, around 88% annually, are sold, consolidated, or reorganized in some form or fashion. Most often, the effect on agents and consumers is nil--but not always. Sometimes these reorganizations result in new underwriting, new pricing, less service and other issues that make doing business with the new company quite painful. 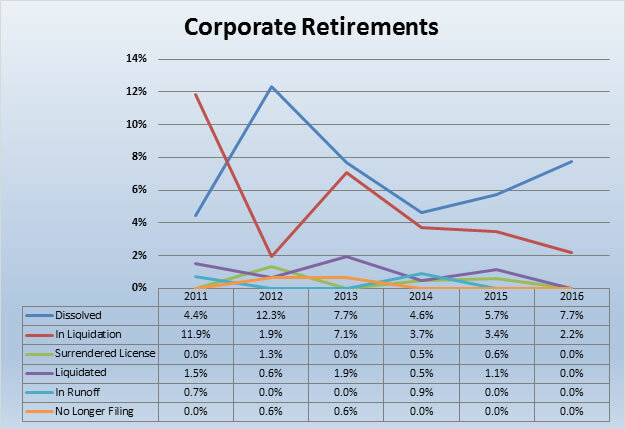 Worse, on average, about 22 companies annually are dissolved, liquidated, surrender their license, go into liquidation (different from being liquidated), go into runoff, or no longer make their filings. Twenty-two out of around 900 companies is peanuts unless it involves you. Another really interesting aspect is that one form of company is not inherently more stable than another. The rate of difficult situations on a percentage of companies with those formations is materially the same for stock companies versus mutual versus even risk retention groups. One point that is missed when analyzing frequency is the potential severity of an agent's E&O if particular forms of companies go insolvent. For example, when an agent has the option of placing an insured in a standard, admitted company but instead places the insured in an RRG or captive, a strong argument can be made the agency must adhere to a far higher standard of care. These kinds of companies may not be covered under the state guaranty funds. One of the results of low insolvencies is that the agency community has lost some collective intelligence regarding what to do if a company goes insolvent. I find many agency people have no idea a guaranty fund even exists, much less the parameters involved. Agents largely have a duty to advise clients whether the entity with whom they are placing that client's policy is covered under the state guaranty fund. This includes surplus lines too. Risk retention groups and captives have quite different funding in many cases than traditional carriers. Often, insureds are potentially responsible for "assessments." Different companies and different types of these alternative carriers use different technical legal terms regarding whether these items are technically "assessments" but to most people, when an insurance company tells an insured it needs to pay more money because the company is out of surplus, it feels like an assessment. For this purpose, I'm going to therefore use assessment. I find that a large percentage of agency people selling these policies have completely and absolutely failed to read the key details in the policy language. Even when the policy requires that a Power of Attorney be signed, somehow the agents have not noticed the vast majority of insurance policies do not require POA's be signed. A halfway curious agent might just wonder why a particular company wants the insured to sign a POA rather than just thinking it is just another piece of paper. When an agent tells an insured to sign a POA and something goes wrong with that carrier, especially involving an assessment, impairment, or insolvency, the insured may have strong cause for coming back against the agent. Bluntly, I do not understand how agents, and I've interviewed dozens and dozens, do not notice these POA's. A word of advice to agents: If you have an insurance company that requires the insured to sign a POA, pay attention! Think about it! POWER OF ATTORNEY! Why would an insurance company want the insured to give them power of attorney over their insurance policy? Isn't this just a little different than normal? The pain of a wobbly company to the agent is not considered in these statistics either. When a company has to sell a division to raise capital, the company may be saved from impairment. The agent though may have to do a whole lot of extra work. Just an FYI, companies sell divisions primarily to raise capital and/or because they are incompetent in managing those divisions which may indicate issues in and of themselves. Such sales can be dressed up, but be sure the reality is that someone has put lipstick on a pig. Another example is actually smart, if it was not nefarious. This is where a wobbly company raises rates far more than other carriers. They say things like the other carriers will follow or that they need to make money in this line or that line or all lines. They have to say things like this. In reality, they are raising rates in hopes that agents will move the business because they may not have the surplus to support their writings. Their number one goal is to get agents to move as much premium as possible. If they make some more profit with what sticks, then so much the better. That is gravy though. The goal is to increase their surplus ratio or reduce their premiums. 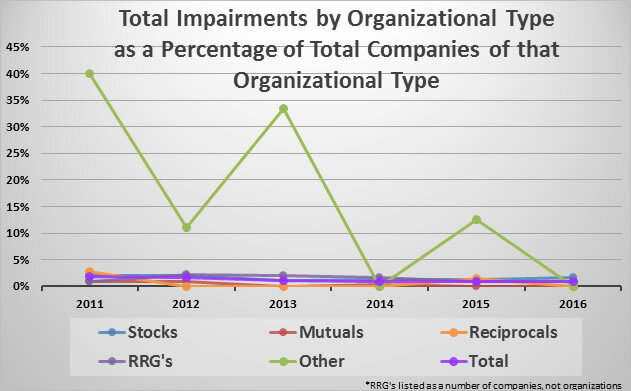 While the frequency of impairments might not be different from one kind of insuring of facility to another and while impairment of frequency is not a major issue, don’t become complacent. Impairments are severity issues and it pays to remain diligent, knowledgeable and protect yourself from E&O claims. However, when a loss does occur, and the reality of the risk does not jibe with what was the expected scenario, we are often left with the question, what could we do differently? In a perfect world, perhaps inspecting every commercial and residential risk would reduce losses. Typically, though, new business gets an inspection and there may not be another look-see for 5+ years. What is the value of a one-off inspection? Traditional inspections are too expensive and take too long to be a viable option for anything "real time" regarding information collection. What if we took a different approach? Self-service inspections. Engage your policyholder! Self-service inspections, where the policyholder is doing the property tour, will reduce costs by 75% and will average 3 days turn around time If you get 60-70% completion rate with your invitations, you can double the number of inspections without spending any more than was done on traditional inspections. What about taking it beyond just self-service inspections? What about if we discard the notion of inspections as a whole? What if we took the approach of an ongoing engagement with our policyholders? Engage vs. Inspect. Loss control could be an ongoing engagement, every 3-6 months, where a particular theme or focus, like the commercial cook line, or home solid fuel burner. With a thematic approach, you would request just 4-6 photos and 2-3 questions be responded to with an app or a bot. Inspections become engagements and morph from "looking" for a problem to co-working to improve the risk profile. The irony here is that typical self-service approaches often focus on reducing interactions with the customer. Self-service inspections however, are created to up the level of engagement. This results in better retention. This FastCompany article, "Why The Future Of Customer Service Is Self-Service", articularly speaks to expectations our clients have around self-service. Self-service inspections can make your policyholders and their staff more self aware. Awareness can be the point of entry for making a proactive decision like ordering a hood cleaning service or moving the stored boxes away from the furnace. Of course, not every policyholder will be enthralled with the idea of engaging with their carrier or agent on a quarterly basis. But how many would? Is avoiding contact with the insured a viable approach in today's connected world? The more relevant "touches" we have with our clients, the better relationship and the better retention. I know that is how I want to be treated! So, what are the 5 things you really need to know about a particular line of business? How can you boil them down to some images and questions? What is the cooking equipment? Is there a hood and duct? Is the duct work clean? Is there an extinguishing system? Is there a current inspection tag on the extinguisher? What are the floors like? If you wonder whether the policyholder will be transparent with sharing information about their property, even if it could be considered a negative, watch this video of actual self-service inspection results and look for the defects! To retain customers, most would agree that you must engage with them. Why not take a legacy process (inspections) and shift it to a channel of engagement? I appreciate how personal they are with clients. That is important to clients and often it is a key reason the owners are even in the industry. This reason, among others, creates an interesting and often rewarding life for agency owners. I appreciate small agencies so much, I even made a promise to a mentor twenty-five years ago that as I succeeded, I would not forget my roots by leaving behind small agencies as my practice grew. Like all small businesses and small accounts, they usually need more help, but will not pay for it. They will not even ask for assistance and often if they are willing to ask and are willing to pay, they do not know for what to ask. When these small agencies need help due to an E&O claim or another kind of legal situation or they need a valuation of their agency for a sale, merger or estate purposes, their data, their accounting methods, and their contracts are so often missing or so disorganized that simply making sense of their situation is a huge challenge in and of itself. Quite often the situation borders on a fiasco trying to find a time to occur. Their accountant does not know anything about insurance agency accounting. Their ignorance has made a hash of the agency's records by trying to fit the square peg of agency accounting methods and systems into regular accounting methods. The accountant not knowing agency accounting has encouraged the agency owners to withdraw too much cash causing a working capital shortage or worse, a trust account shortage. i. The owner is about to spend a lot of money to fix them. ii. The owner will look like a fool. When the data is a mess but the agency owner tells the appraiser, the attorney, the IRS, or the judge: "Just trust me when I tell you what the numbers really are," the silence will be deafening. To many readers, this reads like a ludicrous statement and it is, but this is verbatim what I have heard agency owners say numerous times. Another version is, "Don't pay attention to my financials. They are wrong. Here, I’ll tell you what the right numbers are." I cannot begin to write how many times I have heard agency owners speak some version of these lines. What is even more incredulous is they actually think, firmly believe, the other party is going to trust them! They actually get upset if the other party does not just take their word. They have no idea how bad they appear when they make these statements. The agency has been creative in how they pay people including ex-owners. This appears when they buy the agency and want to deduct the price by paying the owner to do nothing. That is not exactly acceptable. The same usually goes for making producers independent contractors because your buddy advised it was a good way to save money. "If I license everyone, it will cost me more and my staff will migrate to bigger agencies paying more." That does not go well in a deposition. "If I do not have procedures, then the plaintiff cannot accuse me of not following procedures! I win." The agency does not really win because the result is the agency is painted as incompetent. "We do not input data because it takes too much time." Really? "We do not check policies because it takes too much time." Seriously? The solution is to do the work. The reality is that doing the accounting and operating procedures correctly actually saves time in the long run. My estimate, based on the improvements I've seen with my clients, is that approximately a 20% time savings is achieved. Hire an accountant that knows insurance agency accounting or hire someone to educate your accountant on insurance agency accounting. I have done this successfully many times and for constructive people, it is a blessing. Everyone sleeps better knowing they are doing the job right. Do not dig your grave deeper. When you learn that you and/or your accountant has been doing the agency's accounting ineptly or fraudulently and someone points this out, do not try to explain the problem away. Absolutely do not attack the messenger. Be constructive. Spend the time and money to purchase a better agency management system and then learn to use it. Some system’s trainers are not worth $2 and you may have to find third-party trainers. My most successful agencies, in this aspect, almost always use third-party trainers. a. Productivity increases capacity with fewer people. Complete a real audit. Fear seems epidemic with small agencies that an audit will put them out of business, not because of the cost, but what the audit will discover. Personally, I think it makes for more sense for the auditor to discover the issues than a plaintiff attorney. Small agencies usually work with small attorneys and many small attorneys are jacks of all trades and masters of none. They generally are not masters of insurance agency contract law. I have trained many attorneys on insurance agency legal needs. I can refer you to attorneys that specialize in agencies but they likely will be in a different state and you do have to pay. It is so important to use true legal experts. I have seen generalist attorneys write contracts so the agency did not own their own book of business, the buy/sell agreement valued the agency about 2,000% higher than it should have, the agency violated their own by-laws, the owners had to sell their shares for half of their worth, obvious IRS compliance problems were created, and this is the first paragraph in a 100 page book specific to attorney incompetence. Go to conferences with more sophisticated agencies. When you go to conventions, hang out with more sophisticated (not just larger because larger does not always mean sophisticated) agencies rather than commiserating with other small agencies. Don't believe everything you hear but dig for details from the best. Make a mark with insurance companies. Be professional in your submissions. Tell a story. Do not just submit junk or a pile and cause the company to wade through a mess. Some companies open doors for small but professional agencies. At the time of writing this article, my confession is that small agencies have worn me out. I am tired of fighting with agencies regarding what needs to be done with their accounting, their E&O, their carrier relations, and so forth. Almost always, they do not know what they are doing and many refuse to understand they are in a corner and do not have a choice. This is not fun. What is fun is working with agencies of any size that are constructive and proactive. Most bigger and better agencies got bigger and better by being more constructive, listening better, and not refusing to act just because the action was difficult emotionally. They surpassed the emotion and their emotional barriers. Doing so greatly advanced their fortunes, both their monetary fortunes and the quality of their lives. I know that for small agencies, time and money are always short. I do not know how to fix that in the short run but I know how to fix it for the long run and that is take the time to do your accounting, your data, and your procedures correctly now. Bite the bullet. The ROI is high and like the old FRAM oil filter commercial, you can pay now or pay later, but you will pay and if you wait, the cost is likely triple or more what you'll pay now. Is it time to change that filter? "Insurtech is the 'superpower' for assessing, managing and transferring risks...All the players in the insurance arena will be InsurTech..."
One component of this "movement" is something referred to as "big data," more specifically, the miracle cure for perceived stagnant industry profits known as data analytics and predictive modeling. There is nothing new about the importance and value of data and its wiser big brother, information. Predictability, in the aggregate, is the cornerstone of industry stability and profitability. It's the foundation of actuarial science. But, to be of value, the data must be credible and the models that use it must be predictive by more than mere correlation. And, to be usable, the data and models must meet legal requirements by being risk-based and nondiscriminatory. That's where one of my concerns lies. Just how valid and relevant is the data and how is it being used? "Certain domain names are associated with more accidents than others. We use a variety of pieces of information to accurately produce a competitive price for our customers." -- Admiral Group in response to research by The Sun that found the insurer could charge users...extra on their car insurance, simply for using a Hotmail email account instead of a Gmail one." This revelation came just days after The Sun ran an article accusing the UK insurer of charging drivers with non-English-sounding names up to £900 extra for their insurance. I don't know enough about insurance in the UK to opine about the potential discriminatory nature of jacking premiums on people whose names don't sound "English," but my guess is that U.S. state insurance departments likely would not look favorably on this as a rating factor. Historically in the U.S., P&C insurance rates have been largely based on factors that are easily ascertained and confirmed. For example, the "COPE" acronym (Construction, Occupancy, Protection, and Exposure) incorporates most of the factors used in determining a property insurance rate. From the standpoint of the fire peril, frame construction is riskier than fire resistive construction. A woodworker is riskier than an office. Having a fire hydrant 2,000 ft. away from a building is riskier than one 200 ft. away. It makes sense. It's understandable. It's provable. The risk inherent in these factors is demonstrable. The factors are understandable by consumers and business owners. It's easy to identify what insureds can do to improve their risk profile and reduce their premiums. Advice can be given on how to construct a building, install protective systems, etc., in order to reduce risk and insurance costs. Traditional actuarial models are proven commodities and state insurance regulators have the expertise and ability to evaluate the efficacy of rate changes. This is where Insurtech and technology in general can play a valuable role. Using reliabledata on construction and size of buildings, building code inspection reports, satellite mapping for hydrant location, and so forth can have an almost immediate impact on the carrier expense side and potentially the loss component. To large extent, this is actually being done, but the search for something more (or less, if we're talking about expenses) continues. Enter "big data" and predictive modeling, along with a horde of people who know absolutely nothing about the insurance industry but a lot about deluding gullible people with hip press releases. They tout the salvation of phone apps, AI bots, and "black box" rating algorithms with 600 variables and factors. Factors such as whether someone, according to their Facebook page or other online source, bowls in a Wednesday night mixed league where (speaking from personal experience) the focus is more on beer consumption than bowling and how that might impact the risk of an auto accident. "Most organizations base their business decision-making on some form of data warehouse that contains carefully curated data. But big data systems typically involve raw, unprocessed data in some form of a data lake, where different data reduction, scrubbing, and processing techniques are then applied as needed." "Just because something is now feasible doesn't mean that it's a good idea. If your customers would find it creepy to discover just how much you know about their activities, it's probably a good indication that you shouldn't be doing it." Going back to The Sun's Admiral reports, what impression would it make on Admiral's customers if the insurer advertised, "Pay less if you have an English-sounding name!" Would any insurer proudly and publicly advertise something they're allegedly doing behind closed doors? It's like the ethical decision criteria of, what would your mother think if she knew what you were about to do? The right to do something doesn't mean that doing it is right. Does black-box algorithmic rating enable and potentially protect this practice? Our son moved out of the house three years ago and we removed him from our insurance program, including his vehicle. He still uses the same agency (different insurer) I've used since 1973 to insure his auto, condo, and personal umbrella. Our insurer learned that his vehicle registration notice is still mailed to our address. With that information, they (i.e., their underwriting model) unilaterally concluded that he still must live here, so they added him back to our insurance program and made him the primary driver of one of our three autos (the most expensive one, of course). I'm not sure what they thought happened to his vehicle. But, of course, no one "thought" about anything. An algorithmic decision tree spit out a boiler-plated invoice. I've been with this carrier now for four years, loss free, and paid them somewhere in the neighborhood of $20,000 in premiums, yet they could not invest 10 minutes of a clerical person's time to make a phone call and confirm my son's residency. Neither we nor our agent received any notice or inquiry prior to the invoice, but my agency CSR (who, thankfully, is still an empathetic human) was able to quickly fix the problem. I have written about my personal experiences with a prior insurer involving credit scores. My homeowners premium was increased by $1,000 and, by law, I was advised that it was due to credit scoring. As it turned out, the credit reports of a Wilson couple in Colorado were used. Two years later, my homeowners premium was bumped $700 based on three "reason codes" which I was able to prove were bogus and the carrier rescinded the invoice. Now I'm being told that my current insurer's information source tells them that my son has moved back home. I realize that these tales are anecdotal, but three instances in five years? How pervasive is this misinformation? Is this what "big data" brings to the table? Big, BAD data and voodoo presumptive (not predictive) modeling? Who really benefits from this? Anyone? One of the InsurTech buzz words going around is "transparency." What's transparent about "black box" underwriting and rating? At a convention last year, I spoke at length to a data scientist who was formerly with IBM and is now an insurance industry consultant. Without naming names, he characterized some of the predictive models he has examined as "Rube Goldberg" constructs, with the worst ones resembling "a bunch of monkeys heading up the Manhattan Project." Among the many problems with "black box" rating is the fact that no one may be able to explain how a particular premium was derived. No one may be able to tell someone how to reduce their premium. Perhaps most important, regulators may be unable to determine if the methodology results in rates that are unfairly discriminatory or otherwise violate state laws that require that rates be risk-based. Presumably, future rate filings will simply be a giant electronic file stamped "Trust Me." "Big data" might be beneficial to insurers from a cost, profitability, and competitive standpoint, but it's not clear how or even if it will impact consumers in a positive way. All the benefits being touted by the data vendors and consultants accrue to insurers, not their customers. In at least one case, if you have a "non-English sounding" name, the impact is adverse. The counter argument from the apostles of big data is that the majority of people will benefit. Of course, that was arguably the logic used when schools were segregated but that doesn’t justify the practice. In the book "Technically Wrong: Sexist Apps, Biased Algorithms, and Other Threats of Toxic Tech," the author points to an investigation of a correctional facility system that used proprietary algorithms to help decide bail terms, prison sentences, and parole eligibility using various factors, some alleged to be discriminatory (e.g., arrest records of neighbors where the person lived). A Wall Street Journal article, "Google Has Chosen an Answer For You -- It's Often Wrong," demonstrated how searches often indicated a bias or manipulation by whomever constructed the algorithms being used or by how the search parameters were entered by users. Errors in building replacement cost valuations are often blamed on incompetent and/or untrained data harvesters and users...even when the data is presumed to be accurate, it can be used incorrectly. In 2016, I wrote an article for Independent Agent magazine entitled, "The Six Worst Things To Happen To Insurance In The Past 50 Years." Number 3 on my list was the growing obsession with data vs. people. When I write about these things, I know I run the risk of being characterized as the old man on his front porch yelling at the "disrupter" kids to get out of his yard, but I don't think I'm a Luddite. I love and embrace technology. What's next, a SnapChat invitation from an AI bot that says, "Welcome to the Insurance Matrix, Mr. Anderson"? Not yet, I hope. One of the premier insurance educators in America on form, coverage, and technical issues; Founder and director of the Big "I" Virtual University; Retired Assoc. VP of Education and Research from Independent Insurance Agents & Brokers of America. Obviously, the dollar amount is important. Getting the right dollar amount is even more important (I make this distinction because in my experience, some business owners/executives and even quite a few bankers do not understand or sometimes even care about the difference between A Number and the Right Number). However, the number is arguably, especially if contested, only half of the requirement. Depending on the reason for the business being appraised, the actual valuation report MUST meet specific parameters. If the report does not meet these parameters, the value arrived upon by the appraiser may be found meaningless or an opportunity to litigate by tax authorities or plaintiff attorneys. Just arriving at a reasonable number is completely inadequate if the report parameters are missing. It is kind of like buying the wrong insurance policy. The coverage amount might be right but coverage may not exist because the policy is wrong. Matching the correct report with the need is vital. Not knowing or understanding the difference makes business owners vulnerable to con jobs. And many business owners are conned each and every year. First, I advise hiring an accredited business appraiser. All accredited business appraisers must sign a code of ethics and most believe in their code. Some though do not quite believe in ethics as much as others. Some run the same con, but with accreditation. To be fair, I think some complete their reports mistakenly because they do not know any better. They are like insurance people with credentials that can barely spell insurance, much less business income coverage. The better path is to understand the three basic types of Fair Market Value reports and to also understand the huge difference between Fair Market Value (FMV) and Fair Value (FV). FMV and FV are not synonymous. I have seen agency owners, and even accountants and attorneys treat these critical terms as if their meaning was the same. However, many courts treat the values calculated using these two terms quite differently. Summary reports which are often referred to as letter reports (the entire valuation is in the form of a letter) or short-form reports. These reports contain little detail. Informal or Calculation Reports. The report writing standard, the analysis, the degree of confidence that applies to these reports are all relatively low. The margin of error is relatively high. The cost of these reports should therefore be relatively low. These reports rarely discuss the applicability of different valuation methods. Detailed, Written Reports. As the name implies, these are highly detailed reports usually combined with considerable analysis and a thorough discussion of the applicable valuation standards. These should cost the most, all else being equal. Do not confuse a low price with high quality. Some appraisers charge a stiff penny for lower quality reports because the customer does not understand the relatively low quality. Customers tend to think the appraiser just charges less. They think they are getting a Cadillac for the price of a Chevy. They are really just getting a Chevy that might not even be new. The con occurs when appraisers fail to offer clients options, especially the most rigorous option and clients do not know they are comparing apples to oranges when one proposal is for a lightweight appraisal and the other proposal is for a high quality, heavy weight appraisal. One cannot always tell by the price either because the con is to charge as if the lightweight appraisal will be of high quality but just enough less money to get the job. Courts have recognized this problem to some extent. For specific purposes, especially estate taxes, the courts can actually penalize the appraiser. For most purposes though, once the valuation contract is signed, the damages will fall upon the client and not the appraiser. I am not suggesting all reports need to meet the highest standard because they do not. When someone truly needs a decent, back of the envelop valuation that has a large margin of error that is acceptable to all parties, a low standard report should suffice. If litigation, a sale, taxes, or compensation is directly tied to the value, then usually the best option is to spend the money and obtain a high quality valuation right from the get go. Having a low quality report in the hopes that everyone will agree can only complicate the situation if a high quality report is eventually required. Then one may find they have to explain all the factors the low quality appraisal inadequately addressed. My key point though is it pays to understand some basic valuation differences. It pays to understand that a low quality report has severely limited acceptable uses including the fact that one cannot easily dispute the resulting value because the margin of error is so acceptably high. If the calculated value is $1,000,000 plus or minus 50%, then any value between $500,000 and $1,500,000 is okay. These are not easy differences for the uninitiated to understand either. My short summary is a summary of thousands of pages of text book differentiation. Sometimes, especially when the attorneys and accountants involved do not understand the differences, I think clients should consider hiring someone to just explain their valuation report options. The complexity goes far beyond getting a home appraised and choosing the wrong standards rarely is beneficial to any party other than the attorneys involved.